We proudly incorporate Sunbrella brand fabrics for all of our retractable awnings. 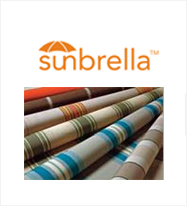 Sunbrella, made of 100% solution dyed acrylic, has been a performance fabric industry leader for almost 50 years because of its aesthetic appeal, impeccable quality, and best-in-class warranties! 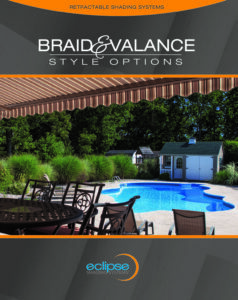 Click here see all your awning fabric options. Relax under the legendary Sunbrella fabric with just a push of a button. This high quality, water-repellent/fade resistant fabric offers essential protection from the sun’s heat and damaging UV rays. You can select from over 150 patterns that ranges from rich solids to stunning stripes in an assortment of sophisticated textures. The professional seamstresses at Eclipse cut and sew the Sunbrella awning and marine grade fabric with both weather and UV resistant GORE Tenara thread. When this combination is paired with our computerized equipment, it gives our company the ability to produce covers that provide unbeatable solar protection. Once you select a fabric, you can choose from several valance cut styles and finishing edge braid colors (for most model units). Your purchase of one of our innovative shading systems comes with a warranty for the Sunbrella fabric cover. We guarantee that it won’t be subject to mildew, rot, and excessive fading for up to 10 years from the original date of purchase. If any of these issues should occur, from normal usage, we will repair or replace your fabric free of charge. Eclipse also offers an optional warranty that provides lifetime coverage, for a nominal fee. Interested in learning more about our wide selection of Sunbrella brand acrylic fabric and the optional lifetime warranty? Use the dealer locator on this page to learn more.